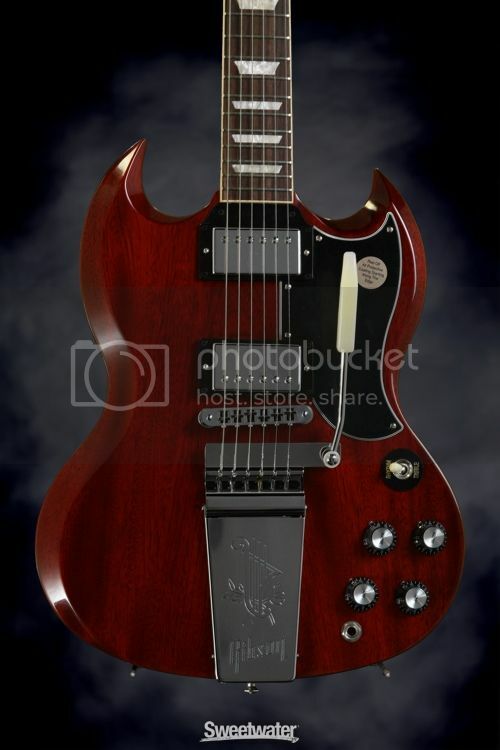 Discussion in 'Gibson SG' started by Steve P, Nov 29, 2012. Edit: The street price at Sweetwater is $1899. It certainly looks the part. I wonder if they got the body contours right? So there is "Historic," "Reissue" and "VOS"...and now there's "Original!" I remember when it was just plain old Gibson. Historics and Reissues are custom shop guitars, and the terms are used interchangeably, VOS is just a finish the custom shop uses. The new SG original is a USA model guitar. A friend from Nashville told me that the 2013 standard isn't actually taken after the '61 reissue it actually is leftover 61's refinished and named to save $$.Not the new "original" but the new standard & after looking at the Sweetwater page I'm pretty sure he's right,plus he's the same guy that let me in on the whole "baked maple" thing before it went public so I believe him. I just came back from my local guitar store and played this same exact guitar, except I think it was the VOS with aged metal hardware. Man, that guitar sounds amazing unplugged. It almost sounds like an acoustic guitar. It has this kind of natural reverb to it. The vibrato arm felt pretty good, but of course it wouldn't stay in tune. It had a price tag of around I think $3,600. I played it for a good half-hour through an all-tube amp. That guitar had some snap to it's sound. They are not just relabeling them. SWEETWATER IS STILL SELLING THE 61 REISSUE they have 4 in stock as i am typing this. The headstocks on the 2012 61 RI is larger than on the 2013 standard, so you cant relabel them. THE STREET PRICE IS HIGHER ON A 61RI THAN IT IS ON A 2013 SG STANDARD. WHY WOULD THEY RELABEL THEM AND SELL THEM CHEAPER?? NOT TO MENTION THE COST OF REFINISHING. THAT IS SOME OF THE MOST EXPENSIVE AND TIME CONSUMING WORK THAT HAS TO BE DONE WHEN BUILDING A GUITAR. It makes no sense to refinish their stock, it would cost them money, not save it. Just to clarify, don't take this as me being mad at you, I'm not, I just hate when people start spreading this kind of s**t around. well, we all have bullsh*t meters built in. sometimes, if it seems like it makes no sense, then IT MAKES NO SENSE. They cost more, but it's worth it. I wish they would offer the Custom Shop Historic SG's in a full gloss finish instead of the just the VOS finish. So what's the difference between the 13 Standard and the above model beside a $600 increase for a trem? Just that. A $600 dollar increase for a trem and Lyre tailpiece. That and the larger size headstock. Otherwise, they're the same guitar. And so far it only comes in heritage cherry, but they might introduce other finishes for it. Just that. A $600 dollar increase for a trem and Lyre tailpiece. That and the larger size headstock. Otherwise, they're the same guitar. Yes, Long & McQuade & they are always over-priced! That one looks like a sale in your link. I really loved that VOS finish and the aged metal hardware. It had a great vibe to it. The unplugged sound gave me goosebumps! It had this ring to it. Maybe the vibrato had a part in the reverb sound of the guitar. And it felt light! A bit lighter than mine. The plugged-in sound had a lot of bottom end and some clear highs. It was a true vintage sound. I felt like I was in vintage heaven for at least a half an hour. I might go back tomorrow for another dose! be gone when you get back there. Of course it may be the lower price that's out of stock. You might be right Sarge! It's probably the lower price that sold out quick. Don't worry Sarge, I'll get the spirit of Captain Beefheart to protect that VOS SG. O' Postman...O' Mine! Ergo, I don't think it was this model you played.